Based on the concept of the award-winning game “Vexed,” Mind Stuck is a free Corona-powered block puzzler for iOS. In Mind Stuck, you’re given an assortment of blocks and tasked with matching blocks of the same symbol and color by sliding them from left to right. While you can push the blocks from side to side and allow gravity to drop them downwards, you can’t move the blocks upwards, making this already tricky game considerably more challenging. Ultimately, the goal is to clear all the blocks in each level. To help you along, Mind Stuck features a “hint system” which guides you through a step-by-step solution of a puzzle in case you become stumped. 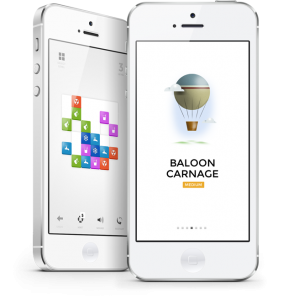 While the app offers a few free hints, you can acquire more through in-app purchases. With more than 200 brain-warping levels, Mind Stuck is a great way to challenge your mind. Download Mind Stuck from iTunes and let us know what you think! Great job. Subtle graphics. I like it. Good game to kill some time.